There’s something about a winter landscape that is just so pleasing to look at. They have a certain calming effect, and make us appreciate Mother Nature that much more. In these eCO2 Greetings business Christmas ecards, the perfect winter scene is displayed, with just about every element of the image as good as it possibly can be. Winters Drift’ is a popular Christmas ecard, and it is easy to understand why. The main focus of the image is the stream flowing from the base of the image off into the distance. Filled with crystal blue icy water, this stream looks extremely refreshing. Around it sits a large amount of snow, covering the sloped banks of the torrent in a clean, yet-to-be trodden layer. The snow also covers rocks and boulders that poke out of the stream itself, and trees off into the distance. Mountains also converge into the centre of the image to finish what has to be one of the most perfect winter scenes you’ll see for a while. 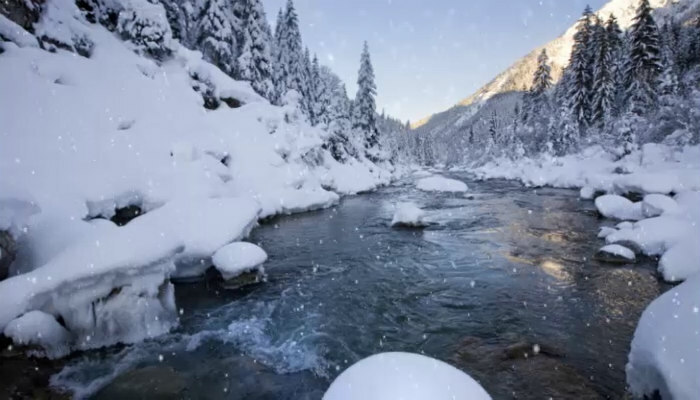 This one of our business ecards which also includes falling snow and a personalised message right in the middle of the stream, offering a satisfying balance to the design. For more ecards from the leading Christmas ecards for business just follow our website navigation to find hundreds of designs to suit your tastes.